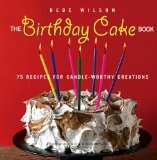 Just like the title says, this book has all the recipes you need for birthday and other celebration cakes. There are basic cake and frosting recipes for you to mix and match as well as dozens of unique combination such as a Confetti n’ Sprinkles Cake, Coco-licious Birthday Cake with Marbled Meringue Frosting (the cover cake), a sheet-style Buttercream Roses Birthday Cake, an Ice Cream Birthday Cake as well as a decadent Mocha Toffee Crunch Birthday Cake, Sour Cream White Chocolate Cheesecake with Raspberries and a Beginner Baker’s Birthday Cake that you can make with a bowl and spoon. For larger school or office parties, try the Office Birthday Cake. Just add the candles. NOTE: there is an error in the first edition in the Red Velvet Cake recipe. The baking soda amount should read “1 teaspoon”.